Correa maintained his support for Australian activist Julian Assange throughout his post-presidential life. 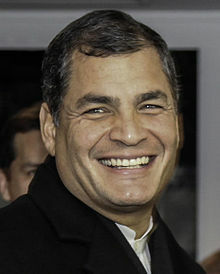 On April 11, 2019, after the Ecuadorian government withdrew Assange's asylum, and later proceeded to call Scotland Yard for his respective detention, Correa continued with the support and opposition to the Lenin Moreno government. To this was added the blockade of his Facebook account, for the community rules of not disclosing personal data, this in reference to the wikileaks cables, that disseminated an investigation carried out in Ecuador, about a secret account of the brother of the president, which Correa spread in his Facebook page. 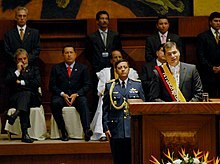 Correa describes himself as an advocate of "socialism of the 21st century", a term referring to a form of democratic socialism previously used by Venezuela's Hugo Chávez.The Economist described Correa as "a left-wing populist", while The Washington Post has characterized Correa's ideological approach as being "economically populist, socially conservative, [and] quasi-authoritarian". 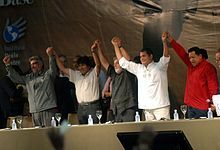 The scholars of political science George Philip and Francisco Panizza claimed that like his allies Morales and Chávez, Correa should be categorized as a populist, because he appealed "directly to the people against their countries' political and economic order, divided the social field into antagonistic camps and promised redistribution and recognition in a newly founded political order." ^ a b c d "Ecuador court orders ex-president's arrest". BBC News. 2018-07-04. Retrieved 2018-07-04. ^ a b Soto, Alonso (14 April 2007). "Ecuador's Correa admits father was drug smuggler". Reuter News – Edition UK. Reuters. Retrieved 14 Apr 2007. ^ "Ha-Joon Chang, "Kicking Away the Ladder"". Paecon.net. Retrieved 2015-12-24. ^ "Gulfnews". Gulfnews. Retrieved 4 December 2011. ^ "Main destinations for Ecuadorian scholarship recipients in 2012: Spain and the United States". ANDES. Retrieved 2015-12-24. ^ "Ecuador cree "firmemente que Obama no estuvo detrás" de rebelión policial contra Correa en". Noticias24.com. Retrieved 4 December 2011. ^ "AP takes the lead with two-thirds of the Assembly | EcuadorTimes.net | Breaking News, Ecuador News, World, Sports, Entertainment". EcuadorTimes.net. Archived from the original on 2013-04-13. Retrieved 2015-12-24. ^ "Crude Oil Prices - 70 Year Historical Chart". www.macrotrends.net. Retrieved 2019-01-16. ^ "Presidente Rafael Correa envió Ley de Plusvalía a la Asamblea". El Comercio. Retrieved 2019-01-16. ^ "Impuesto a la herencia irá del 2,5% al 77,5% y será por heredero". El Comercio. Retrieved 2019-01-16. ^ "Presidente R. Correa incrementa aprobaciĂłn ciudadana, del 75% al 81%, segĂşn encuesta in". ElCiudadano.gob.ec. Retrieved 4 September 2012. ^ "10 leyes polémicas que aprobó la Asamblea Nacional del 2013-2017". El Comercio. Retrieved 2019-01-16. ^ "Correa's approval rating slips". country.eiu.com. Retrieved 2019-01-16. ^ "If you can't beat 'em, referendum". The Economist. November 15, 2014. ^ Nick Miroff (March 15, 2014). "Ecuador's popular, powerful president Rafael Correa is a study in contradictions". The Washington Post. ^ "Blood and fire: mining and militarization in the Ecuadorian Amazon". The Ecologist. Retrieved 2017-02-05. ^ "Paz entre Ecuador y Perú "es irreversible", recalca presidente Rafael Correa" (in Spanish). Andina.com.pe. 9 June 2010. Retrieved 15 June 2013. ^ "Presidente Rafael Correa es nombrado Doctor Honoris Causa en Rusia" (in Spanish). Elciudadano.gob.ec. Retrieved 15 June 2013. ^ "Prensa Latina News Agency". Plenglish.com. 1970-01-01. Retrieved 2015-12-24.